Amnesty supporters worldwide wrote letters supporting U Kyaw Hla Aung in prison in Myanmar. This 75-year-old lawyer from the persecuted Rohingya minority has been jailed repeatedly for his peaceful political work. After being released last October, he tells us what he is fighting for. What does it mean to be Rohingya in Myanmar? People are afraid of us because we are Muslims. The government doesn’t want to give us citizenship, even though we were born here and have lived in Rakhine State [western Myanmar] for a long time. They have been calling us Bengalis [from Bangladesh] since 1971. Their policy is to get the Rohingya people out of this country. 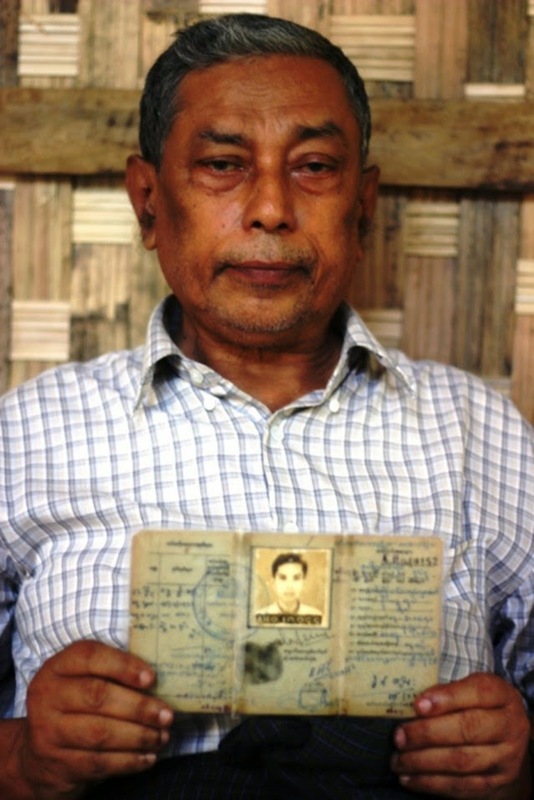 U Kyaw Hla Aung holding his National Registration Card, a document from the 1950s that proves that he has lived in Myanmar for a long time. You were released from prison on 7 October 2014 after more than a year. Why were you there? As I am a lawyer they disliked that I was meeting with ambassadors and journalists, so they made up a case against me and arrested me. You received letters from Amnesty supporters worldwide. What did that mean to you? I was very happy to receive the letters in prison – they encouraged me, my health and my morale. I am so thankful because the letters brought attention to me so that the prison authorities had to take care of me and my health. You are married with seven children. How has your activism affected you and your family? They hardly survived when I was in prison. My daughter had to travel to the prison every week to give money to the police, so I could get food. I live in a bamboo hut in a camp for internally displaced people near Sittwe [the Rakhine state capital]. It’s difficult for me to live here - I can’t do things openly because the government is watching me. The community doesn’t want me to leave, but my health isn’t good, and my children can’t get an education or medical help. What needs to happen to help the Rohingya? The government needs to give us citizenship and the international community should also recognize the Rohingya as citizens of Myanmar. Don't write that I am the hero of the Rohingya community. I am doing these things for everybody.